After a chance meeting on a train platform, a married doctor (Trevor Howard) and a suburban housewife (Celia Johnson) enter into a muted but passionate, ultimately doomed, love affair. 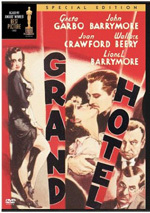 With its evocatively fog-enshrouded setting, swooning Rachmaninoff score, and pair of remarkable performances (Johnson was nominated for an Oscar for her role), David Lean’s film of Noel Coward’s play Still Life deftly explores the thrill, pain, and tenderness of an illicit romance, and has influenced many a cinematic brief encounter since its release. Although I know much more about films than does the average person, my knowledge base lacks the depth I'd like, and most of my lapses come in the area of older pictures. DVD has been wonderful in this regard, especially since I started to do these reviews, as I’ve gotten a good film education over the last 13 years. When I saw Criterion's release of Brief Encounter on the schedule back in 2000, I decided to review it because the film was directed by David Lean. At the time, I knew more about Sizzlean than I did about David Lean, so I welcomed the chance to witness additional examples of his work. Tragic admission: before Encounter, the only Lean film I’d ever watched was Lawrence of Arabia. Yes, it's pathetic, but it was true. One thing is certain: Brief Encounter shares little with that epic. In fact, the exceedingly small scope of the film makes it virtually a polar opposite of that later extravaganza. Not that this is a bad thing, for "bigger" doesn't necessarily mean "better". That said, I can’t say I’m wild about Encounter. It provides a competently-made and mildly compelling film but it doesn't stand out as anything special to me. As I mentioned, the focus of Encounter remains very narrow, as it concentrates almost exclusively on a short but passionate extramarital relationship. By happenstance, housewife Laura (Celia Johnson) and doctor Alec (Trevor Howard) meet as they wait for their respectiuve trains, and from there they slowly embark upon their few weeks of love. Though the phrase didn't exist in 1946, Encounter is a prototypical "chick flick" and it most definitely will find greater favor among females. As for myself - and I'm most definitely all man, baby! - I could enjoy parts of the film, and I could respect the craftsmanship, but I never could develop any real interest in the storyline or the characters. Encounter adapted a Noel Coward short play called Still Life. Apparently that production only lasted about half an hour, so the movie needed some extra material to stretch to a still short 86 minutes. Although there's little in Encounter that seems readily identifiable as "padding", I did feel that it appeared to drag for too long, and that's not a good thing in such a brief film. There's simply not a lot happening here, and I didn't find the characters compelling enough to carry me along for the ride. Both Howard and Johnson are very good in the parts, and they definitely helped keep me as mildly interested as I was, but the plainness and predictability of the story made me weary of the whole thing long before it ended. Brief Encounter isn't a bad film, and it has a few moments that work pretty well. Unfortunately, there are too few of these moments to help sustain my interest. Plain and simple, stories of this sort aren't my cup of tea, and it seems likely that fans of the "women's film" genre will get more out of it than I did. However, don't expect a whole lot from it, as the substance simply isn't there. Brief Encounter appears in an aspect ratio of approximately 1.33:1; due to those dimensions, the image has NOT been enhanced for 16X9 televisions. Taken from a recent restoration, the transfer looked quite good. Overall sharpness was positive. At times, a little softness crept into some wider shots, but those instances remained rare; instead, the film was usually accurate and concise. I noticed no issues with jagged edges or shimmering, and edge haloes remained absent. Blacks demonstrated nice depth and richness, and shadows were also well-rendered. Low-light shots offered good clarity, and contrast seemed fine, as the movie came with an appealing silver sheen. Source flaws appeared minor at worst; the occasional small speck appeared, but the majority of the flick looked clean. I felt impressed with this age-defying presentation. Note that Criterion opted to windowbox Brief Encounter. This left thin bars on the vertical sides of the image and small but larger bars on the horizontal sides. I didn’t think the windowboxing was a significant distraction, but given the general lack of overscan from modern TVs, I thought it was unnecessary. As for the film’s monaural soundtrack, it also has held up well over the decades. Speech came across with a fairly natural sense and good intelligibility; any reediness or edginess failed to mar the proceedings. Effects weren’t a major consideration in this chatty flick – moving trains offered the most prominent element – but they sounded fine. While the effects lacked much depth, they were acceptably clear and lacked distortion. Music was also acceptable. The movie mostly used pre-recorded elements, and these sounded fine; they failed to provide much pep, but they seemed fine. The track didn’t suffer from any notable noise, hiss or other distractions. The soundtrack was more than satisfactory given its age and ambitions. How did the 2012 DVD compare to the Criterion DVD from 2000? Audio seemed more concise and clear, while visuals came across as tighter and cleaner, with better shadow reproduction as well. This was a nice upgrade across the board. The 2012 DVD includes the same extras as the prior release as well as some new ones. In terms of carryovers, we get the film’s trailer and an audio commentary from film historian Bruce Eder. He provides a running, screen-specific discussion of the source material and its adaptation, story and character areas, crew, cast and performances, music and sound design, visuals and cinematography, sets and locations, and the film's reception. I enjoy this kind of film critic commentary, and Eder covers the appropriate subjects well. He mixes thoughts about the movie with reflections on its era and related areas. Eder sags occasionally but usually moves things along well and turns this into a useful piece. The remaining bonus materials are new to this DVD. To learn more about Noel Coward, we go to an Interview with Author Barry Day. This runs 16 minutes, 20 seconds and features info about the source play and its adaptation, themes and interpretation, cast and performances, and a few other areas. Day repeats some of the info from the commentary, but he still delivers a brisk, interesting encapsulation of the various subjects. Next comes a 24-minute, 31-second featurette called A Profile of Brief Encounter. It offers notes from screenwriter/producer Ronald Neame, actress Margaret Barton, actress Celia Johnson’s daughter Kate Fleming, Noel Coward biographer Sheridan Morley, producer Sir Anthony Havelock-Allan, and actor John Sessions. 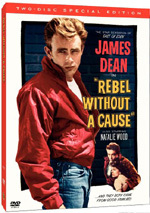 The show examines the original play and its adaptation to the screen, cast and performances, and the film’s reception. As was the case with the Day interview, inevitable repetition occurs here, but it’s nice to hear from some first-hand participants, so we learn a few new details here. Lastly, we locate a 1971 documentary entitled David Lean: A Self-Portrait. This goes for 58 minutes, 21 seconds and delivers notes from Havelock-Allan, filmmaker David Lean, director of photography Freddie Young, screenwriter Robert Bolt, and producer Sam Spiegel. Though it does include those other folks, “Self-Portrait” usually concentrates on the comments from Lean himself. He quickly runs through the films he directed and we then hear about more general attitudes toward filmmaking and his career. Because “Self-Portrait” moves so quickly, it can’t deliver much depth, but it’s still worthwhile just to hear from Lean himself. Like all Criterion releases, this one comes with a booklet. 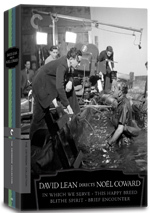 The 48-page “David Lean Directs Noel Coward” includes essays from film historian Ian Christie, Terrence Rafferty, Farran Smith Nehme, Geoffrey O’Brien and Kevin Brownlow; these cover the Coward/Lean partnership as well as individual thoughts about the four movies they made together. It provides a good conclusion to the package. Brief Encounter provides an early look at the career of David Lean, although one won't find any of the scope or grandeur of his later films here. Instead, Encounter remains a very small character piece that’s too mushy and sentimental for my liking. The DVD provides solid picture and audio along with a fairly nice roster of supplements. While the movie doesn’t do much for me, I think it’s a professional, respectable effort that looks and sounds better than ever on this 2012 DVD. Note that as of March 2012, this version of Brief Encounter can be purchased only as part of a four-DVD set called “David Lean Directs Noel Coward”. It also includes In Which We Serve, This Happy Breed and Blithe Spirit.